Mold in some form or another is virtually everywhere – in the air we breathe and on the surfaces we touch. So why is it such a big deal if mold grows in your basement? The fact is, too much mold is never a good thing, and if you’re living in a home with excessive mold growth, that can start to lead to problems. For those especially sensitive to mold, those problems can become serious health concerns. According to the Centers for Disease Control and Prevention (CDC), being exposed to a damp, moldy environment may cause a variety of health effects for some people. Is mold in your home making you or a family member unhealthy? 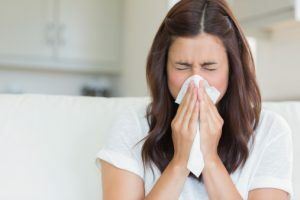 The CDC indicates that for people with mold sensitivities, exposure can cause numerous health ailments that include nasal congestion, throat and eye irritation, coughing, wheezing and sometimes, skin irritation. If a person suffers from mold allergies, these symptoms are often amplified. Those with compromised immune systems or with lung disease could suffer from serious lung infections if exposed to mold. And, there is scientific evidence to back up the claim that mold can cause illness – in 2004, the Institute of Medicine found that there was sufficient evidence to link indoor mold exposure to illnesses such as upper respiratory concerns, coughing and wheezing in people who were otherwise healthy. How can you protect yourself from mold exposure? With all the evidence that mold exposure can cause a whole host of health concerns, it seems likely that most people would want to take all necessary measures to remove it from their home. Your basement is the perfect climate for mold growth, and if you have excessive basement moisture, leaks in your floors or foundation, or plumbing issues, then you likely have mold growing there. Woodwork, paper or cardboard storage containers, fabrics, upholstery and carpeting are all mold-friendly, too. Not only might your basement walls be moldy, items you’re storing there could be, too. If you’re dealing with basement mold, the experts at Basement Waterproofing, Inc. can help you get the mold remediation you need. There are companies you can hire that will come into your home and remediate the mold in your basement – but not solve your problem. That means the mold will come back time and time again. That’s where BWI is different. We work to first remedy your wet basement problem, and then we clean up your basement to get rid of any mold growing there. We use a specially formulated anti-mold cleaner on the entire surface of your basement upon the completion of every job. We’ll spray your basement for mold and other harmful pathogens with our patented commercial spray that kills everything up to and including the H1N1 virus. BWI wants to help you with mold remediation so you can live healthier. You won’t have to suffer with basement mold – and the uncomfortable side effects that often go along with it – when you choose BWI to help you with your mold remediation needs. When you need basement mold treatment, let our experts talk to you about our SEC anti-mold spray, as well as the many services we offer that will get rid of your basement moisture problems for once and for all. For your convenience, we’re fully staffed during normal working hours to answer your calls – just call us at (800) 439-4951 and we’ll be glad to help you.